Home » Test Prep » What Should You Expect From Test Prep Materials? What Should You Expect From Test Prep Materials? What are test prep materials? Publishers design test prep products to help students to improve their performance on standardized tests. Generally, test prep products help students prepare for standardized assessments by providing practice tests and related content that reflects exam questions in form and substance. How well aligned are test prep materials to state standards? As referenced in their correlation documents, some test prep publishers attempt to address* all grade level standards. Many publishers attempt to address only the standards that are eligible for assessment in the particular grade level and subject. Still other test prep products focus solely on a subset of the grade level standards (e.g., the content standards). Regardless of which standards the material attempts to address, test prep materials rarely address those standards in their its entirety. Rather, the products often address only the part of the standard the publisher believes is likely to be assessed on the standardized test. Moreover, test prep resources are not always aligned to each standard they attempt to address. For all of these reasons, we find that test prep materials are often not aligned to 100% of the grade level standards. For example, we have reviewed four test prep materials for 8th grade science. The table shows what we found the products’ alignment percentages to be. But, the alignment percentages alone do not describe which resource would be best for your students. We found the 67% aligned material to have multiple aligned citations for every standard the publisher addressed (i.e., all the content standards). 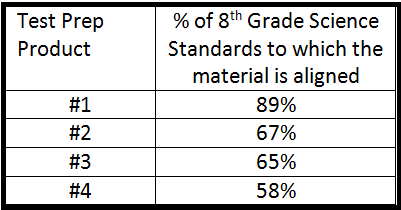 The only reason that product’s alignment percentage was not higher is because the material did not address any of the 8th grade process standards.In contrast, the remaining three test prep products addressed both content and process standards. However, none of those materials was aligned to all of the standards they addressed, and none had consistently as many aligned citations for each standard as the 67% aligned material. Learning List’s alignment reports shows you which standards each material is/is not aligned to and how many citations we found to be aligned to each standard. What should you look for when selecting test prep materials? For the reasons articulated above, when assessing the value of a test prep material, look beyond the alignment percentage. Determine which standards the product is aligned to and whether there are a sufficient number of aligned citations (i.e., test questions) for each standard at the appropriate level of rigor to provide your students with the practice they need to prepare them for the standardized test. Test prep products vary widely in the amount of support they provide to prepare students for exams. Some simply offer practice tests that familiarize students with the format of the exam. Others provide guidance in taking notes, studying, and test-taking strategies, as well as day-of-test behaviors that support improved performance (e.g., eat a good breakfast). These resources aim to help reduce students’ test-related anxiety and improve their scores. Many online test prep materials provide immediate, corrective feedback and direct students to the specific content they have not yet mastered.Test prep materials also differ in the supports they provide for teachers. While some materials limit teacher resources to test overviews and answer keys, others provide rubrics and online tools that enable teachers to see patterns in class and individual student performance. These tools help teachers identify and reteach the content that students have not mastered and group students for targeted intervention. In sum, to find the test prep material that best meets your students’ needs, you must look beyond the alignment percentage to see which product is aligned to the standards students are struggling with, which will provide sufficient practice and support for your students, and which includes the instructional resources and monitoring tools your teachers need. Once you have selected a test prep product, be sure you use it to prepare students only for the standards the material is aligned to. *The standards that a material “addresses” are those listed in the publisher’s correlation (i.e., the standards the publisher believes the product covers). A material is only deemed to be “aligned” to a standard if the material teaches/assesses the content, context and cognitive rigor of the standard (i.e., all of the knowledge and skills the standard requires students to learn).